Full pool, full of bass, and just waiting for some persistent angler to discover. I recall one particular trip that took place in late January. On a cloudy, warm day following a three-day warming trend, we had over 30 bass in one day of frantic feeding fish. 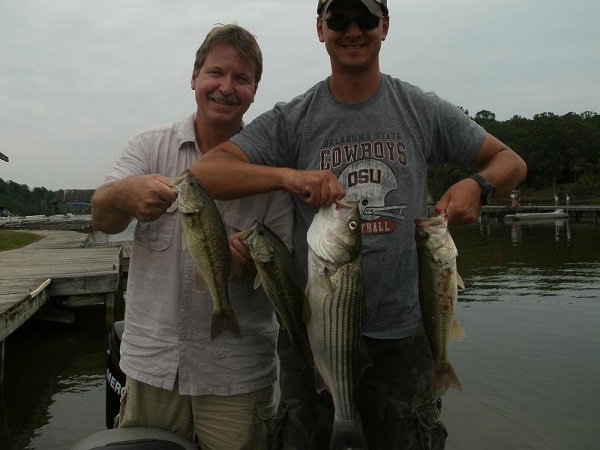 Seven spotted bass, averaging near 4 pounds each, weighed in at Paradise Point Marina (site of the 1996 and 2002 Bassmaster’s Classic) topping the scales at over 28 lbs. Most were caught on jerkbaits and zara spooks. One month later, at the peak of this 6-week warming trend, I spooked one up weighing 8 lbs. It was caught in a creek in water temperature near 60 degrees! 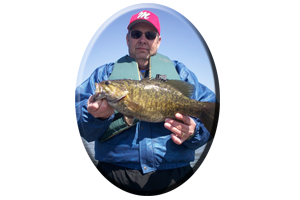 In between these normally cold months, we caught and released several bass from 5-7 lbs, all on topwaters and shallow running lures. These abnormalities could take place again this winter, if warming trends once again encourage bass to move shallow. In between these spring-like conditions, bass can be caught by many means. Flipping and pitching jig combos and tube baits to weed edges, piers, thick matted weeds, rock banks and bluffs, or fan-casting creek and river flats, when schools of baitfish are evident, are also great tactics for winter bass on Lay lake. Some weeds die during winter, but still some dead weeds hold bass that relate to them as cover. Either that or they are holding on wood or rock cover within these once green hideouts, many bass call home. Swimming a jig, is a popular tactic on Lay Lake for covering water fast and getting the big bass bite. “Flipping or Pitching” in an around these dead or decaying weeds with jigs, tube baits, worms and lizards take a lot of semi-dormant bass, bass just waiting for a easy meal dropped right in their faces. 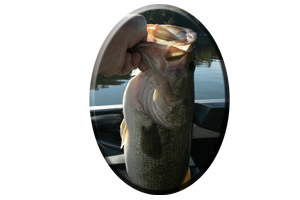 Keep it in mind on some days a mouthful of pork, plastic or an over-sized offering, will get the bigger bass bite. On other days you must downsize your lures to even get bit. 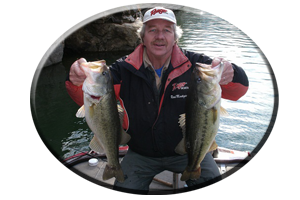 Spinnerbaits catch bass year-round on Lay Lake and during December, January and February, many anglers take their share of line-stretchers as they slow-roll or drop heavy spinnerbaits in deep water haunts. Spotted bass are suckers for these flashing and vibrating lures as they invade their domain. Largemouth’s found shallow around weed and wood cover are very susceptible to spinnerbaits, especially when the water temperature is in the upper 50′s, with a slight stained look to the water. 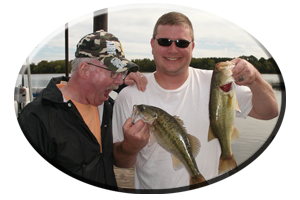 When targeting these feisty Coosa River bass many anglers fish the main river. From top to bottom these tenacious bama bass will nail; buzzbaits and zara spooks (the louder the better), spinnerbaits and jerkbaits (with erratic retrieves), jig combos, Carolina-rigged and Texas-rigged worms, crayfish and lizards (slow), tube baits, and other gaudy type plastics like creature baits and even swim baits. Deep-diving crankbaits (especially chartreuse), rattletraps (red is good in winter) and grubs, just to name a few are good lures. During water generation, try fishing the outside bends of the main river. Especially where slack water, eddy areas, provide ambush hideouts for spotted bass that seem to tolerate swift current a little more than the largemouth bass. 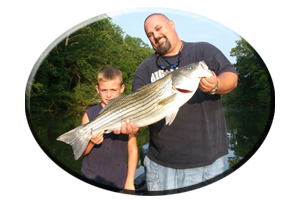 Although a few largemouth hogs can be had at times around stumps, weeds edges, lay downs, points and the lower ends of islands. Up and down river these tactics work around cuts, pockets, islands and creek mouths or other current-breaking sanctuaries. * Or you can call always call on Reeds Guide Service (205) 663-1504 for fishing Lay lake or any Alabama lake, year round!